C'est très bien qu'il y ait des Français jaunes, des Français noirs, des Français bruns. Ils montrent que la France est ouverte à toutes les races et qu'elle a une vocation universelle. Mais à condition qu'ils restent une petite minorité. Sinon, la France ne serait plus la France. Nous sommes quand même avant tout un peuple européen de race blanche, de culture grecque et latine et de religion chrétienne. 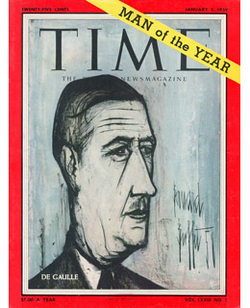 Qu'on ne se raconte pas des histoires ! Les musulmans, vous êtes allés les voir ? Vous les avez regardés avec leurs turbans et leur djellabas ? Vous voyez bien que ce ne sont pas des Français ! Ceux qui prônent l'intégration ont une cervelle de colibri. Essayez d'intégrer de l'huile et du vinaigre. Agitez la bouteille. Au bout d'un moment, ils se sépareront de nouveau. Les Arabes sont des Arabes, les Français sont des Français. Vous croyez que le corps français peut absorber dix millions de musulmans, qui demain seront vingt millions, après demain quarante ? Si nous faisions l'intégration, si tous les Arabes et les Berbères d'Algérie étaient considérés comme des Français, les empêcheriez-vous de venir s'installer en métropole, alors que le niveau de vie y est tellement plus élevé? Mon village ne s'appellerait plus Colombey-les-Deux-Eglises mais Colombey-les-Deux-Mosquées. It is very good that there are yellow French, black French, brown French. They show that France is open to all races and has a universal vocation. But [it is good] on condition that they remain a small minority. Otherwise, France would no longer be France. We are still primarily a European people of the white race, Greek and Latin culture, and the Christian religion. Arabs are Arabs, the French are French. Do you think the French body politic can absorb ten million Muslims, who tomorrow will be twenty million, after tomorrow forty? If we integrated, if all the Arabs and Berbers of Algeria were considered French, would you prevent them to settle in France, where the standard of living is so much higher? My village would no longer be called Colombey-The-Two-Churches but Colombey-The-Two-Mosques. 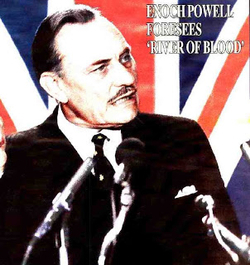 Enoch Powell is remembered for one thing only, his "Rivers of Blood" speech. total transformation to which there is no parallel in a thousand years of English history. In fifteen or twenty years, on present trends, there will be in this country 3 ½ million Commonwealth immigrants and their descendants. … Those whom the gods wish to destroy, they first make mad. We must be mad, literally mad, as a nation to be permitting the annual inflow of some 50,000 dependents, who are for the most part the material of the future growth of the immigrant-descended population. It is like watching a nation busily engaged in heaping up its own funeral pyre. If all immigration ended tomorrow, the rate of growth of the immigrant and immigrant-descended population would be substantially reduced, but the prospective size of this element in the population would still leave the basic character of the national danger unaffected. This can only be tackled while a considerable proportion of the total still comprises persons who entered this country during the last ten years or so. Hence the urgency of implementing now the second element of the Conservative Party's policy: the encouragement of re-emigration. all who are in this country as citizens should be equal before the law and that there shall be no discrimination or difference made between them by public authority. … This does not mean that the immigrant and his descendants should be elevated into a privileged or special class or that the citizen should be denied his right to discriminate in the management of his own affairs between one fellow citizen and another. There could be no grosser misconception of the realities than is entertained by those who vociferously demand legislation as they call it "against discrimination", whether they be leader-writers of the same kidney and sometimes on the same newspapers which year after year in the 1930s tried to blind this country to the rising peril which confronted it, or archbishops who live in palaces, faring delicately with the bedclothes pulled right over their heads. To be integrated into a population means to become for all practical purposes indistinguishable from its other members. Now, at all times, where there are marked physical differences, especially of colour, integration is difficult though, over a period, not impossible. Related Topics: History, Immigration | Daniel Pipes receive the latest by email: subscribe to the free mef mailing list This text may be reposted or forwarded so long as it is presented as an integral whole with complete and accurate information provided about its author, date, place of publication, and original URL.